When you want to enjoy unique shopping in Branson, try to shop at the Grand Village Shops where you’ll find a great display of Peter Engler Woodcarving Designs which are all Made in the USA By Hand. Peter Engler is one of the famous woodcarvers in Branson that began selling his craft products in 1962 at Silver Dollar City theme park. The woodcarving designs of Peter Engler is being considered as the center of woodcarving in the United States. Peter had established a shop in Branson in 1962, representing over 200 artists. He passed away in 2012, but his legacy remains. Peter Engler began discovering his artistic gifts of drawing and carving in Minneapolis, MN, at the age of 10. In 1951, he joined the Marine Corps and amongst the ones who experienced rigorous routines of the Korean War. He would use the little down time that he had, pull out his pocketknife, and carve one of his whimsical little figures. In 1962, he and his wife Virginia moved to Branson, leaving his mother’s art and gift shop in Lakeview, AR and established the Mountain Woodcarvers Shop at Silver Dollar City. 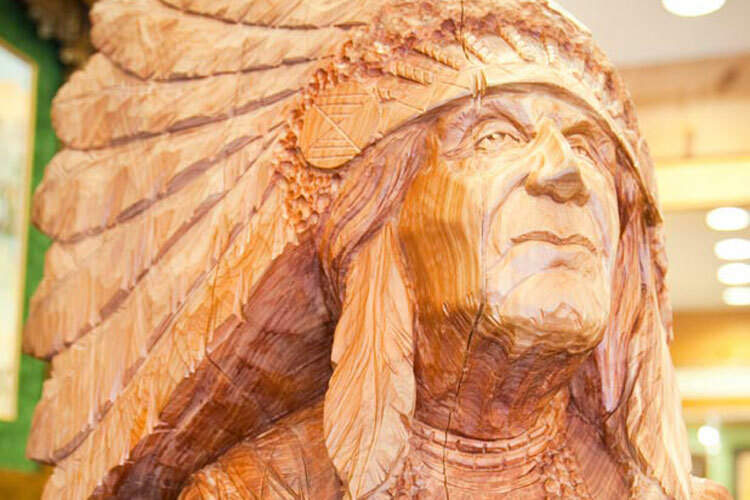 As a skilled carver, he began to establish as a national figure of woodcarving and showed expertise with his whimsical carvings, life-sized Indians, Santas and more. Along with woodcarving, Peter began to build the foundations needed for the arts and crafts in building a community in Branson. He went on to open shops in Branson and in Gatlinburg, TN. Peter started Silver Dollar City’s Fall Arts and Crafts Festival, co-founded the National Festival of Craftsmen and became very instrumental in the development of Ozark Mountain Christmas. Peter has been an inspiration to people who knew him. He always had a listening ear and encouraged everyone to learn the art of carving. Devoting much of his time to carving his beloved Santas, the Ozarks became home for Peter and his family. Peter’s friend and business partner Mary Bowman has kept his dream alive by promoting over 150 local artists. They offer daily demonstration of carving and pottery making. As a retail store, Peter Engler Designs features a wide display of local gallery quality works of art. Although woodcarving is the main feature, many talents are available by local potter, silversmith and various types of woodworkers. Woodcarving tools and carving supplies are available at the shop. Peter Engler Designs is not the only unique shop to visit at the Grand Village Shops located in the middle of Branson’s entertainment district at 2800 W. Highway 76 on the famous Branson Strip. You will also find Thomas Kinkade Signature Art Gallery, Helwig Art Glass, and Mark Karpinski Photography that will add to your unique shopping in Branson. From apparel, gift, specialty, toy, book and jewelry stores, your shopping experience at the Grand Village Shops provides a charming relaxing shopping venue that is unique in Branson. Peter Engler Designs offer unique shopping in Branson as it’s in this shop where you can find woodcarving designs which are all Made in the USA By Hand.